This is a snapshot that I took in Scotland 2009. I was looking for a motive for a photocontest. The topic was "contrast". 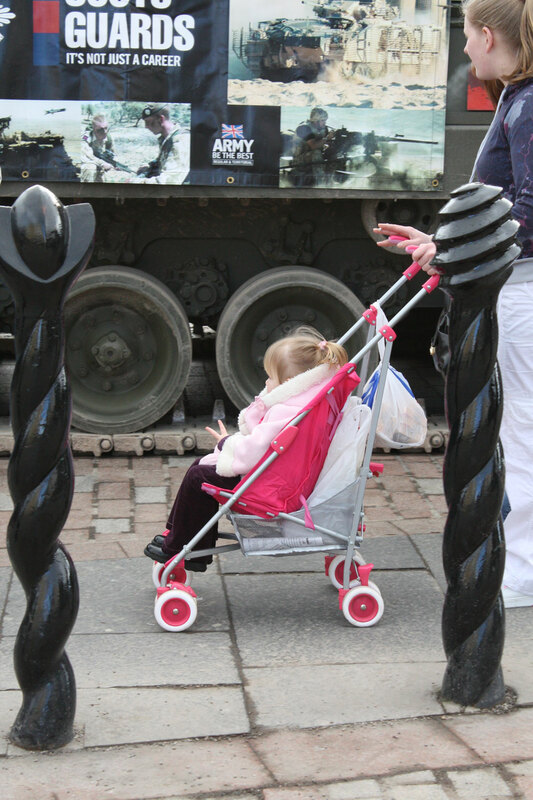 I saw the pink girl being pushed towards the tank that was put up for an army recruiting event in a Scotish town we walked through. And what does she do right infornt of the tank? The peace sign? That was one lucky shot! Diesen Schnappschuss habe ich in Schottland 2009 gemacht. Ich war auf der Suche nach einem Bild für einen Photocontest mit dem Thema "Kontrast". Ich sah, wie das Mädchen in Pink auf den Panzer zugeschoben wurde, der für eine Armeerekrutierungsaktion aufgebaut war. Und was macht sie, als sie genau vor dem Panzer ist? Das Peace-Zeichen? Da habe ich wohl Glück gehabt.